"Can Eve and the NYPD take on two gangs and win?" Lyle Pickering had beaten the odds. He's served time in prison, left his gang, stopped using illegal drugs, and is now living with his sister, Dr. Rochelle Pickering while working as a cook at a nearby restaurant. Meanwhile, Roarke wants to hire Rochelle as the head therapist at An Didean, a shelter and school he is building to help young people feel a sense of community while seeking therapy, education, and rehabilitation. Unfortunately, Rochelle's excitement over the job offer is destroyed when she returns home from a celebratory night out to find Lyle dead from an apparent overdose. She knows it can't be true and her boyfriend turns to Lieutenant Eve Dallas to investigate. What ensues is a dark journey into the underbelly of gangs lurking in New York... but Eve intends to see that justice is done. CONNECTIONS IN DEATH is the 48th book in the spectacular�In Death�series. CONNECTIONS IN DEATH focuses more on the police procedures that Eve, Peabody and the rest of our favorite police officers have to follow and thus can be read as a standalone with little issues. Most of the ongoing threads are explained sufficiently for a new reader to jump right in. However, I can't imagine not reading every single J.D. Robb book in the�In Death series because yes, these books are just THAT good! While I love Eve and Roarke, the secondary characters in the�In Death�series are what create the storyline depth that keeps me coming back for more. I love that we get to see more of Crack in CONNECTIONS IN DEATH as J.D. Robb shows us a softer side of him. The book opens with an Oscars party so we briefly get to see some of our other favorites, such as Mavis, but we later get to spend quite a bit of time with some of the law enforcement officers we've grown to love, such as Baxter, Trueheart, Jenkinson, and Strong. And of course, there's lots of Peabody, including some touching scenes that made me love the camaraderie of the characters all the more. J.D. Robb works her magic as CONNECTIONS IN DEATH is yet another page-turning but oh-so-different installment in the� In Death�series. I particularly love the whole underlying redemption theme as we see how Eve wrestles with the sadness that follows the death of someone like Lyle Pickering. J.D. 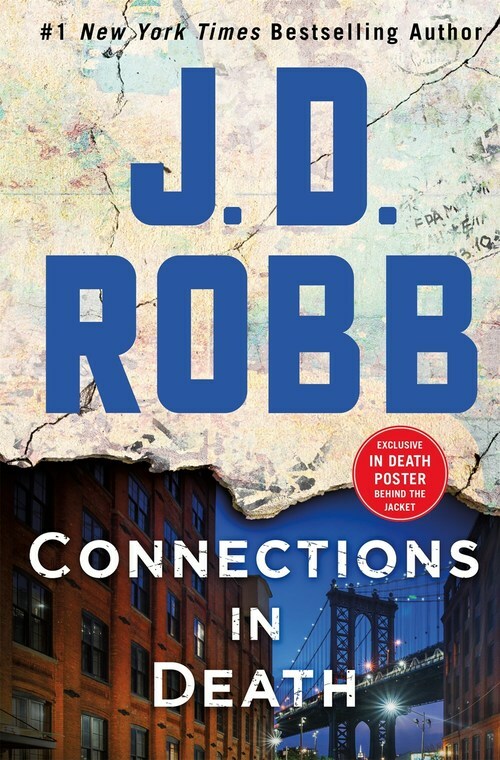 Robb fans will relish this 48th installment in the�In Death series as we delve into a darker side of her futuristic version of New York City. Re: Can Eve and the NYPD take on two gangs and win?